Nutmeg was a famous spice in Europe during the middle ages. The mace - the red skin that covers the seed - was very expensive commodity at that time. The competition among major western powers for the monopoly of these spices triggered wars in Banda islands sponsored by VOC - a multinational trading company from the Netherlands. Thousands of people were killed in the war. VOC opened huge nutmeg plantation, deployed soldiers, and built fortresses to protect their business in these islands. British empire under King James I, used to occupy Rhun, one of the islands of Banda until 1624. The British and the Dutch continued to compete for the control of the archipelago until 1667. In that year, they signed the Treaty of Breda where the British gave the control of Rhun to the Netherlands in exchange of Manhattan island and New Amsterdam city. Later, they became what is now known as super modern New York city of the United States of America. The meat, seeds and mace of nutmeg are ingredients in food, cosmetics and medicines. 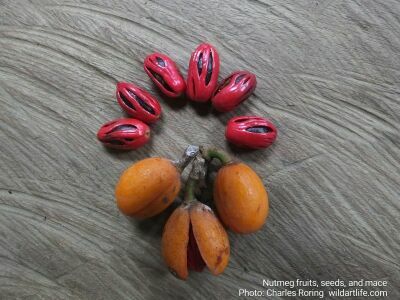 In Indonesia, nutmeg fruits are processed to make sweets. First, the fruits are washed, peeled and soaked in alum water to remove the sap. Second, the fruits are rinsed with clean water and dried. The next process will be cutting the fruits into small slices and adding sugar and some salt. Finally, the fruits will be dried and packaged. When everything is ready, the manufacturer of the nutmeg sweets could ship them to supermarkets and kioks. Nutmeg seeds can also be added to food such as meat or chicken soup that is boiled together with carrots, cabbage, or red beans. The seeds only give fragrant smell to the food and enhance its tastes. The seeds will not be eaten. From my personal experience, after eating such soup, I will fall asleep. So, if somebody suffers from insomnia (difficulty in falling asleep), he or she can try eating soup that has been cooked with nutmeg seeds. There are also oils that are mixed with nutmeg essential oil for use in spa and massage centers.